ChiaoGoo crochet hooks feature a metal head with a Chinese Moso bamboo handle. Each hook has the size laser imprinted into the handle. Sizes 16 - C are nickel-plated steel. Sizes D - J are aluminum. Q: Hello. I was curious if someone could tell me if the metal on these hooks is for sure steel? Does it say stainless steel on the packaging? Thank you. Q: Are the Chiaogoo metal head hooks in-line or tapered style? Thank you! They are inline. I will add a new picture to our product listing that will show the hooks better. Q: Hi, What is the total length of the hooks in inches? I am interested in size H and I hooks. Thank you. Q: Hi! Do these not come in sizes Q and N (16mm and 9mm)? I like metal crochet hooks but am not sure if they make the metal ones this large. 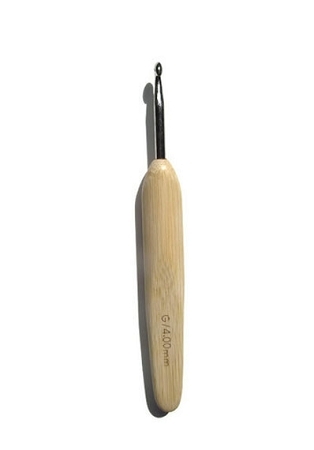 If not, is there a wooden crochet hook you recommend that is as close to a metal one as possible? Q: Would this be the same size as the very old designs of steel crochet hooks size 8 that would be used for making lace, etc - very fine crocheting using sz 10 crochet cotton?